Over the past weekend when I went to the Texas State Fair I learned that I am descended from the Norse Vikings!!!! I have learned that they had blonde or red hair and blue eyes. I have blue eyes and my blonde hair has a red tint to it. I always wondered why I am the only one in my family to have a red tint to my hair and am happy to find out it is because of my Norse Viking ancestors. 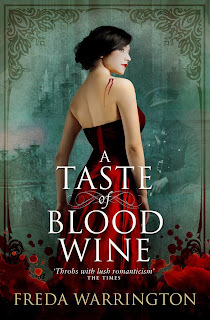 Okay now on to my review of "A Taste Of Blood Wine" by Freda Warrington and it's confusing. "Karl von Wultendorf, though a vampire himself, is completely under the power of his maker, Kristian, who demands total servitude. When Karl meets, and falls in love with, Charlotte, he realizes that he must find a way to kill Kristian, for Kristian has decided to teach Karl a lesson in power, by devouring Charlotte." I honestly don't know what more to say about this book. In all honesty, I skipped some pages because I felt that it went a little slow. This is the first book of a new series and I unfortunately don't think I am going to read the next ones. It's a classic tale of Vampire falls for human, human falls for vampire, maker wants to kill human, vampire saves human and so on. I loved how the author wrote very great detail, but I felt like it went in circles and repeated the same thing over and over again. It was worth a shot, but I believe that it could have gone better. Some parts were good, other parts you wanted to throw the book across the room. I don't recommend this book, because I don't believe that it is worth the time it takes to read it.